2.1 Natural products such as marble, stone and granite will be subject to natural colour variations, imperfections and sizes from any samples presented. There may also be variations in Quartz stone (i.e. man- made products). Unless the goods are faulty, we accept no liability for any variances in this respect. 2.2 Should any variation from the sample you have seen be important to you, you may inspect the product to be used at our factory in Welham Green or at our suppliers prior to cutting but otherwise you will not be able to cancel your order once the product has been cut. Please let us know in writing if you require inspection so we can arrange this. 2.3 Any alterations you make after templates have been made will be subject to an extra charge. 2.4 If we are asked to delay the fitting of your worktops after manufacturing for more than 4 weeks, we reserve the right to charge additional ‘storage cost’ at the rate of £30 + VAT per week. 3.1 As all orders are made to individual requirements, orders cannot be cancelled after we have cut your product, unless we are in breach of our obligations to you. 3.2 If you want to cancel your order you must tell us in writing. 3.3 If, after we have carried out a survey, and this is unsatisfactory, we reserve the right to cancel your order after having given you a full written explanation of the adverse conditions encountered. We will also refund all money deposited by you. 4.1 Prices and delivery charges are in pounds sterling (GBP) exclusive of VAT. VAT will be added to all charges at the current rate where applicable. We reserve the right to revise prices and details without notice but we will confirm these with you before accepting your order. 4.2 Payment should be made by cheque payable to “The Marble Group Ltd”. 4.3 All prices on this web site are subject to change without notice. Whilst we make every effort to provide you the most accurate, up-to-date information, occasionally, one or more products on our website may be mis-quoted. In the event a product is listed at an incorrect price due to typographical, photographic, technical error or human error, The Marble Group Ltd shall have the right to refuse or cancel any orders placed. Our quotes are valid for 90 days from the date shown. 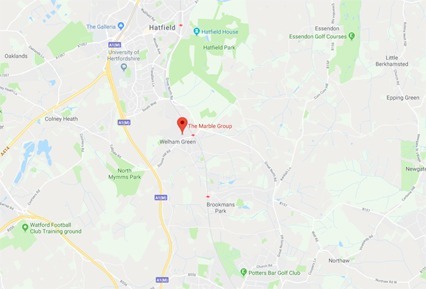 The Marble Group Ltd – Welham House, Travellers Lane, Welham Green, Herts, AL9 7HF 4.4 A 50% deposit is required with your order before we carry out template. This also covers material costs. 4.5 Remaining balance is required as cleared funds BEFORE delivery/fitting. 4.6 Our lead time varies depending on several factors, and as such will be confirmed when your order is placed. 4.7 Your order will not be scheduled or a lead time given until we have received all of the following: • Full details / survey / drawings of what you require • Your deposit • Signed approval drawings, including any special details (or approval email) • A written purchase order, including any special details / arrangements (or confirmation email) 4.8 All products remain our property until we are paid all the money you owe us. 4.9 Late payments will be charged interest at 4% above Bank of England base rate. 5. Anyone who places an order with us on behalf of a limited company agrees to be jointly and separately liable to us so we can demand payment from you as well as from the limited company. 6.1 Delivery dates are estimates only. We will endeavour to deliver all goods on the agreed date. In the unlikely event that your order is not made available within 30 days of the agreed date you have the option to cancel the order by giving written notice to us. However, a change of order may impact on the delivery date and this should be confirmed when amending an order. 6.2 In the event of any one or more items being out of stock, we will inform you and give an estimated delivery date. 6.3 If you require delivery only of the product with no installation by us, this will be to a mainland UK address only. If no one is available at the address at the time of delivery, the driver will retain the goods, and we will await further instructions. There will be an extra delivery charge in this situation, which must be paid before re-delivery. If the goods are to be left without you being present, then full payment must be received prior to delivery, and we cannot accept responsibility for incorrect delivery or loss of goods when the customer is not present to accept the goods. 6.4 We shall have no liability to you for any failure or delay in supply or delivery that is caused by events or circumstances beyond our reasonable control. 6.5 Most orders will be delivered by lorry or large van so it is important that you tell us about any restrictions on access at the time of your order. If we are to incur parking fines then this could be charged back to you the customer. 6.6 All deliveries will be delivered to the address stated on the order and this will typically be kerbside delivery, depending on the vehicle used. If kerbside delivery is not suitable, goods will be unloaded to the nearest easily accessible and safe access point for the address stated. 6.7 We will not connect or plumb any appliances or undertake any ‘skilled’ carpentry work. We recommend you call ‘skilled’ tradesman in to carry out any such works. 7.1 Any claim you make for faulty or poor workmanship must be notified to us as soon as reasonably practicable after the problem is discovered. To avoid any confusion or delay notification should be made to us in writing or confirmed in writing. 7.2 Chips and Repairs: In the unlikely event of your worktop being damaged, The Marble Group reserves the right to make small repairs to damages or chips that may occur on sintered/ceramic surfaces as well as fragile marble and granite. If we deem the repair has been completed to a satisfactory and acceptable standard, we will accept the matter as being rectified. Please understand during the fabrication, handling or installation process these may occur and will not justify the replacement of material. 7.3 We may charge you our reasonable costs if there is no defect or the defect is not our responsibility. 8.1 If you have notified us of a problem, we will either make good any shortage or non-delivery; replace or repair any goods that are damaged or defective upon delivery; or refund to you the amount paid by you for the goods in question. 8.2 We shall have no liability to pay any money to you by way of compensation other than any refund we make under these conditions. Our liability to you shall not in any event include losses related to any business of yours, such as loss of profits or business interruption, neither will we be responsible to you for any other loss which is not a foreseeable consequence of us being in breach of these Terms and Conditions or our legal duties. 8.3 Once you have purchased your ‘man made’ worktop you must register your product with the manufacturer to claim your ‘Warranty’, you must have proof of receipt. 8.4 If you are a consumer, nothing in these Terms and Conditions will reduce your statutory rights relating to faulty or miss described goods or work that is not carried out to a reasonable standard. You should contact your local authority Trading Standards department or Citizens Advice if you need more information about your statutory rights. 8.5 Nothing in these Terms and Conditions is it intended to exclude our liability to you for fraudulent misrepresentation or for death or personal injury resulting from our negligence. 8.6 If you are a trade customer we will not be responsible to you or, in the event that you are undertaking work for another person, to any other person, for the use or installation of any goods by you. Accordingly, if you are a trade customer, you agree to hold us harmless, and indemnify us against any liability associated with, any claim or allegation that we are responsible for any failings in the installation or use of goods that we supply. 9. This agreement is governed by English law and the English courts or by the law of the courts governing where we delivered the goods to if this is outside England or Wales.